4. Tag six people at the end of your post and link to them….heh, heh, heh. 5. Let each person know they’ve been tagged and leave a comment on their blog….oh, they’ll know. 6. Let the tagger know when your entry is up….got that, Abel? Before I get to dealing with number 3, I have got to lay down my marker on the altitude bragging competition going on between Abel and Dr. Isis. Now I can’t claim more than 12,000 ft under my own power — but when I was working on this film I made repeated rapid transitions from 8,400 ft. to 16,700, and on one occasion, a little more. (I’d like to say 17k, but I was probably a hundred feet or so short). This was up in the high Atacama Desert, very close to the point where Bolivia, Argentina and Chile come together. I was there filming precision cosmologist Tony Readhead use his Cosmic Background Imager to measure CMB to finer resolution than had previously been achieved. It was high enough, and we weren’t doing the kind of proper acclimatization needed to work at those altitudes unaided, so we walked around with little bottles of oxygen, taking hits of the good stuff at a regular, measured rate. Let me tell you, folks: until you have seen the southern sky at night — on a moonless night — with the Milky Way like Broadway across the sky and the Magellenic Clouds creating a density of light and pattern that no northern view will ever hold, right after a great big hit of oxygen to get your eyes in focus….you haven’t seen the stars. That won’t impress my old friend David Breashears, any, but I sure do like making astronomy films, and time at altitude is a big reason why. 2. I used to be able to read while riding in a car, which resulted in my memorizing virtually all of Walter Brooks Freddy the Pig series. 3. I met Louis Leakey in 1972, in the last summer of his life. He and my Uncle, a British soldier turned farmer, had known each other in Kenya, and Dr. Leakey had come to recuperate from some heart trouble in a village near the farm. He came to tea and held court for a couple of hours. I was fourteen, bored and sulky, but he evoked questions, and I found myself in my first real conversation with a working scientist. It was a transformational event — mostly I recall how he described his questions, and how each one raised and addressed led him to another. This, I thought was cool. (Also–most of what he talked about was contemporary biological anthropology, not the paleo-sort for which he was famous. That too, I thought was cool, the fact that he didn’t confine himself to ploughing the same furrow over and over again.) (Bonus note — Jane Goodall’s mum was keeping Leakey company, so I got to meet her thirty six years before I met Jane herself). 4. Echoing Abel, I too have taken money from a pharmaceutical company, Smith Kline Beecham, happily agreeing to act as the “before” poster child in a before and after campaign for the Hepatitis A vaccine, having had a ruinous bout of that illness following a film shoot in Mexico. I had no pangs of conscience in taking money for what I would have done for free: encouraging everyone to get vaccinated against Hep A and now, in a combination vaccine, B. With the new vaccines (now not so new, I guess) there is no reason anyone should suffer what I went through, not to mention the worse prospect of a B infection — so don’t be stupid folks; go get the jabs. 5. I drive a convertible. In New England. In winter. It is a matter of principle that the top go down at least once in every month. So now, who to tag? How could one pass up the opportunity to learn a half dozen “facts” about Jen-Luc Picard? Elizabeth Pisani — and not just because her book and her blog has perhaps the best name ever. Carl Zimmer, nicely settled in to his new digs at Discover.com, and not just because I am reading with pleasure right now his Soul Made Flesh. Unlike the five above, I’ve never met or corresponded with Cosma Shalizi, but his blog is a consistent joy. I tend to check it about once a month and read up on all that I’ve missed — like this astonishingly wonderful antidote to my monomaniacal election obsession. Don’t know how he’ll take to being tagged by a stranger, (not well, I’d guess) but, worth a shot. 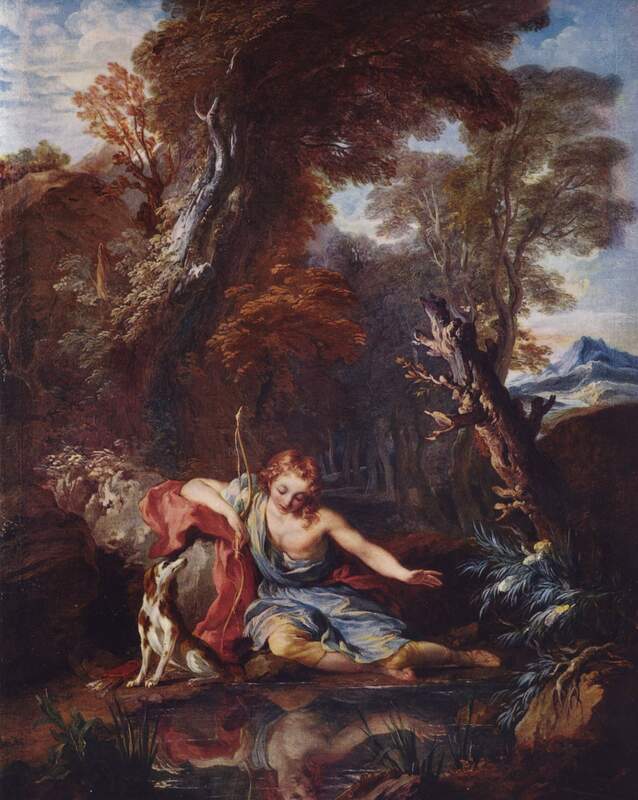 Image: François Lemoyne, “Narcissus,” 1688. Source: The Yorck Project: 10.000 Meisterwerke der Malerei. DVD-ROM, 2002. ISBN 3936122202.